Home » » Mahaweli Authority Turns Forestlands Into Bare Lands? Director General Mahaweli Authority is accused of ignoring a Supreme Court ruling to obtain 12,900 hectares of forestlands in the Padaviya Forest Reserve. 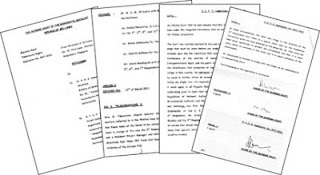 With a letter (Ref LUP/ MPT/ 19) dated March 27, 2013 to Conservator General Forest, Director General, Mahaweli Authority has requested to release 12,900 hectares from the Padaviya Forest Reserve for a resettlement drive and development work. Although DG Mahaweli Authority has made such a request, Programmes Manager Green Movement of Sri Lanka Ranjan Karunanayake claims that this is an act of contempt of court as there is a ruling not to use forestland for any development activity and that protection of environment is the duty of every citizen. The Green Movement of Sri Lanka filed legal action in Supreme Court in 2010 against Mahaweli Authority, State Timber Corporation, Forest Department and Environment Ministry for clearing up state lands to an extent of 3,920 acres in the Mullaitivu District in Mahaweli ‘L’ zone, which included a forest reserve. “When we inquired the Forest Department, Forest Conservator confirmed that out of the 3,920 acres, an extent of 250 acres were within a forest reserve. It was said that the land was taken on the pretext of a resettlement drive to remove the timber within the forest. On that basis we had to file legal action against the authorities concern for destroying the forest,” added Karunanayake. Considering the facts the Green Movement said the Supreme Court had delivered an order to prevent such forest destructions in future, which takes place under the pretext of development work. “We filed a Fundamental Right case in Supreme Court (SC FR 567/ 2010) in 2010 against the Mahaweli Authority, Environment Ministry, Forest Department and Timber Corporation for destroying 3,920 acres of forestland at the Kokilai Forest Reserve on the pretext of a resettlement drive. The ruling was delivered on March 11, 2011 preventing Mahaweli Authority from destroying forestland for any development work,” said Karunanayake. According to Karunanayake, ¾ of the required land in the Padaviya Forest Reserve is an area where endangered species are found and if the forest is cleared, there will be no forest patches for the natural habitat of these endangered animals. “At a time when the Mahinda Chinthanaya has clearly stated that forest cover would be increased by 35% by 2016 in order to protect wildlife, it is questionable why the Mahaweli Authority wants such a large extent of forestland for a resettlement drive and other development work. This required land is in the border of North Central Province and there is no necessity to resettle people in this province. The resettlements have to be carried out in the Northern and Eastern Provinces, as it is the people in these two provinces that were displaced during the war. There are many government bare lands if Mahaweli Authority wants to resettle displaced without requesting forestlands,” said Karunanayake. Director General Mahaweli Authority, Gamini Rajakaruna however said that the said Supreme Court ruling was against one such case, but added that the ruling did not comply with Mahaweli Authority Act, which has given powers to obtain lands from Forest Department with their consent. “We are planning to construct two reservoirs in the area and that is why I requested the Forest Department to release this land for development work. Under the Mahaweli Authority Act we have the power to take any land for any development work. Since I am empowered to implement this act I made such a request which is legal,” said Rajakaruna. 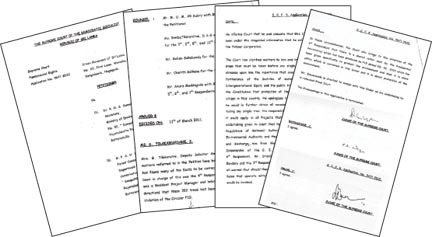 However when asked whether he is acting against the Supreme Court ruling of March 11, 2011, Rajakaruna said that the particular order was given only for one case, but that does not act in accordance with Mahaweli Act. “The Mahaweli Authority has failed to submit the exact details to court as to why we had to cut down trees in that particular area. I am following the rules and regulations in the Mahaweli Act as I am empowered to implement those regulations for any development purposes,” added Rajakaruna. When asked what these development works are, Rajakaruna said that it differed according to the requirement. “I can release Mahaweli lands for private parties for agriculture purposes, to construct hotel projects or even to blast granite rocks within the forest. The purposes vary from one another,” said Rajakaruna. However, Acting Conservator General Forest, S.A.A. Haturusinghe said that discussions are underway with the Mahaweli Authority officers, but added that the Forest Department has not yet taken any decision so far whether to release the said land. “Since I am acting for Conservator General I am unable to furnish all the details as I am also not aware of the discussions. It is up to the Conservator General to take the final decision with the Ministry officials. According to the Supreme Court Order, neither the Mahaweli Authority nor the Forest Department can make any such requests to release any forestlands,” said Haturusinghe. Meanwhile, Deputy Conservator Forest, W.A.C. Weragoda when contacted said that it was up to the Forest Department to protect all forest reserves in the country. “Although there is a request to release 12, 900 hectares of forestlands from Padaviya forest reserve, we have not yet taken any decision. However if there are people settled within the forest reserve we will release those lands, but not any other lands. Since there is a Supreme Court ruling we have to consider that as well before taking the final decision,” said Weragoda.